The Infuse 4G is a huge phone, but is it a huge success? The Inspire 4G is a niche phone, but anyone who values a large screen and a good camera should be tempted. The Samsung Infuse 4G feels a bit like a phone with an identity crisis. It costs the same as the Epic 4G Touch, but is excluded from the Galaxy line. It's got a 4G right in the name, but it doesn't boast 4G speeds. And at 4.5" it's also large enough to feel almost like a tablet - albeit one rocking the stale Froyo Android OS. But is it a good phone? 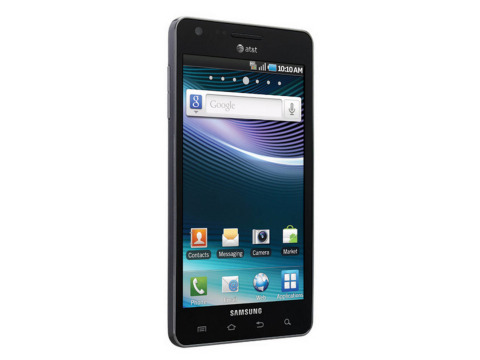 The first thing anyone will notice about the Samsung Infuse is its gargantuan 4.5" Super AMOLED display. Samsung is no stranger to large displays; its flagship Galaxy S2 rocks a 4.3" screen, and the Samsung Galaxy Note is actually, legitimately, a tablet-phone crossover poised to launch stateside in early 2012. But no matter how its predecessors feel, the Samsung Infuse's large screen and small borders make it feel bigger than it actually is. Those with small thumbs might want to look elsewhere, or else risk having to hold the phone in two hands. For others, the extra screen real estate will feel comfortable. This is at least in part due to the phone's thickness and weight - at only 131g (less than .30 pounds) and 8.8mm at its thickest the Samsung Infuse is thinner and just about as light as the Samsung Epic 4G Touch. The frame chassis feels a bit cheap, with slippery angular plastic. It has a grippy back, which also serves as, quite possibly, the world's thinnest battery cover, and can easily be pulled off. This gives you easy access to the battery, SIM, and the interchangeable microSD - which is hidden (not to mention upside down) beneath the SIM card. You don't have to remove the SIM card, just the 1760mAh battery, to access the microSD - if you can find it. You'll likely want to replace it as the onboard microSD it comes with is an inadequate 2GB. The internal memory sits at 16GB, but it's easy to imagine filling if you want to watch a few movies on that posh screen. There's also the usual features - a 3.5mm headphone slot on top, speakerphone on the back, Micro-USB on the bottom. That Micro-USB doubles as a high-definition video output as well, but you'll need to use an (included) optical dongle. We'd have loved to see a notification light somewhere on the Infuse, but besides that and a cheapish feel, build quality is just good enough to be adequate. The Infuse 4G can be yours for $199 with a two-year contract from AT&T.